Challenges designed for children aged 5, 6 & 7yrs. Tasks are repeated over 1 minute. Challenges designed for children aged 8 & 9yrs. Tasks are repeated over 1 minute 30 seconds. Challenges designed for children aged 10 & 11yrs. Tasks are repeated over 2 minutes. We recommend that you set up your physical activity area before the start of the challenge so that you can focus your full attention observing your child/ren and keeping track of their scores/achievements. To prevent injuries make sure the floor is clear, dry, and any obstacles that could cause harm are removed. a responsible adult is present to ensure the challenges are completed as per challenge description. Stand 2 metres from the wall, throw a large ball (i.e. football size) against a wall and catch it using a two handed throwing and catching technique from your chest. Stand 1.5 metres from the wall, throw a small ball (i.e. tennis ball) against the wall with your right hand and catch it in your left and then throw with the left and catch it with the right, and so on. Using two footed jumps, jump in each numbered square of the grid starting at number 1 and finishing in square 4. Repeat for 1 minute and 30 seconds. Each completed circuit counts as 1 point. Using a standard bench or chair, start with both hands holding onto the bench and both legs to the left hand side. See how many two footed jumps over the bench/chair you can do in 2 minutes. Each complete bench hop scores 1 point. Run between 2 cones / lines set 6 metres apart, each completed length earns 1 point. 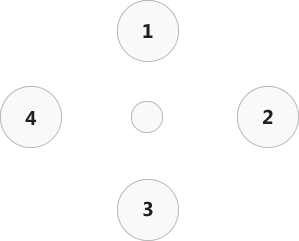 Run from the centre cone to each numbered cone/spot (1.5 metres) and back again in sequence (centre spot to 1 and back, centre spot to 2 and back, and so on). Designed for children aged 5, 6 and 7 years. Complete as many star jumps as you can in one minute. Start with your feet together and arms down by your sides. Jump from this position to finish in a star position, landing with your feet apart and arms at shoulder level. Your legs and arms need to move at the same time. Then jump to return to the starting position. You will be awarded 1 point for each completed star jump. You get one point each time you reach and touch a cone. Designed for children aged 8 and 9 years. Throw a large ball against a wall and catch it again using a two handed throwing and catching technique from your chest. Complete as many throws and catches of a ball in the time given. Using two footed jumps, jump in each numbered square of the grid starting at number 1 and finishing in square 4. Repeat for 1minute and 30 seconds. To go as fast as you can you will be jumping forward to square 1 to 2, backwards from 2 to 3 and forwards again from 3 to 4. See how many circuits you can complete in 1 minute and 30 seconds. Run in and out of 4 cones set out evenly between cones A & B set 6m apart. Complete as many slalom runs as you can in 1 minute and 30 seconds. Designed for children aged 10 and 11 years. Use a small ball stand 1.5 metres from a wall, throw the ball with your right hand and catch it in your left and then throw with your left and catch it with your right, and so on. Complete as many alternate hand throws and catches as you can in 2 minutes. Complete as many bench hops as you can in 2 minutes. Run from the centre cone to each numbered cone/spot (1.5metres) and back again in sequence, see how many completed circuits you can do. If there is insufficient strength to complete and chest to wall throw, then ensure the child has a partner to whom the ball can be thrown and returned. If coordination is insufficient to complete the alternate hand throw and catch then use a two-handed underarm throw. Start with legs together and arms by your side then jump so both legs and arms go out sideways together (making the shape of a star) before jumping back to your starting shape again, see how many star jumps you can do. The star jump could be changed to a resisted arm pull by starting with the arms above the head or in the lap, and then widening them to the maximum and returning them to the start position. This could be made harder by stretching an elastic exercise strap to increase the workload. Alternatively, your child could simply manoeuvre their wheelchair side to side so that the front wheels go back and forward between two points about 2 feet apart. The wheelchair could also be used to follow the same pattern as for the coordination jump challenge. If the two footed bench hop is too difficult then a two-footed jump across and line marked on the ground will be more accessible for some children. All the running challenges can be adapted so that they are wheelchair accessible. You may need to adjust the distances a little to help but the same patterns can be followed. Use other forms of travelling if these suit your child’s skill set. For example bottom shuffling, hopping or walking. For children who tire quickly, then complete the challenge in four equal time quarters with a rest in between. All the above are examples and possible suggestions. It is important that your child can access the challenges and, as you know them well, you can always choose and use an alternative skill linked to the specific challenge that suits their specific ability. If you have any further questions or queries regarding the Activity Challenge or the supporting activities please contact activitychallenge@fitforsport.co.uk or call the Fit For Sport Activity Challenge team on 020 8742 4990. Copyright © 2019 Fit For Sport.